Oh, Boston. We may not have the tallest buildings. We may not have the nicest weather. We may not have the lowest crime ratings or highest income per capita or, hell, even the best nachos. But it cannot be contested that Boston has the best sports scene in the country. Besides our teams across the board being phenomenal (except maybe the Revolution, but who watches soccer? ), Boston fans cheer the loudest (Irish alcoholism pays off) all year ’round. 1) Replace stomps with chomps. Example: “DE-FENCE!” *Stomp*Stomp* becomes “DE-FENCE!” *Chomp*Chomp*. Note that your cheering may get a little muddled–whoever thought up this chant did not provide a flexible time to swallow between cheers. 2) Combine your cheese and salsa into one of the two compartments. Not only is this much more convenient for dipping, but you also free up a spot for your beer! 3) Unless you’re looking for comical banana-peel moments, don’t drop the extra jalapenos on the ground in front of you. Trust us. 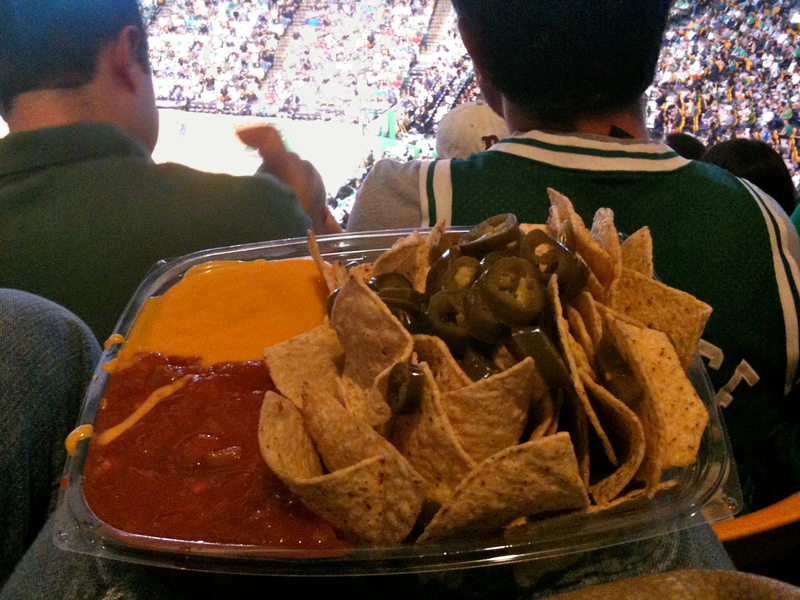 As for the nachos themselves, they’re about what you can expect from stadium fast-food. If you’re looking for culinary uniqueness with complex spices and mastermind cooking techniques, may we recommend the sausage cart? Appearance: (3) It must have taken a lot of food coloring to get the “salsa” that red. Quality of Ingredients: (3) The cheese sauce was surprisingly spicy! Besides that delightful goody, though, the chips were straight out of a bag, the salsa was flavorless, and the jalapenos were soggy. Distribution of Toppings: (1) Distro-whaaa? Overall: 10/40. Yes, the numbers add up to 12, but think of the sheer potential TD Bank Garden has to come up with creative ‘chos. The salsa is practically Gatorade anyway, can’t they at least make it green? Offer them in a box shaped like a basketball field with salsa and cheese dip where the hoops are? Give us some round chips with a basketball pattern etched on with pepper?!? ANYTHING? For lack of imagination, we’re penalizing TD Bank Garden 2 points. This review in no way reflects upon the Celtics, who, after finishing off the Magic in Orlando in front of their demoralized fans, will undoubtedly sweep Phoenix (or possibly LA) to bring the Conference Championships title home to Boston for the 18th time. GO CELTICS!